No Flash music player visible? Please allow scripts in your browser, then his text will be replaced by the Flash music player. Nick Magnus is a highly accomplish composer and a polished keyboards wizard who first came to prominence as keyboards player in Steve Hackett's 'live' and studio band just after he departed from Genesis. After that period in his career he masterminded several platinum, gold & silver status albums, two of which were the huge selling 'Project D' albums which features synthesiser based cover versions of popular international instrumental hits. His first solo album; 'Straight On 'Till Morning' (now deleted, but CDS still has some copies) was a big seller for us, but it only hinted at the majesty of what was to follow in the form of this new 'Inhaling Green' project. Musically, his new album represents everything that I have stood for since I first started buying LP's back in the late 60's - Class music played by a craftsman of the keyboards. It's is synth, but not all synth, it's prog, but not all prog, it's commercial, but not all...... etc, etc, etc. In fact it is one of the best and most varied keyboard derived (plus guitar, bass, flute and percussion) albums you will ever have the pleasure of listening to, and pleasure is the keyword for me, because this is one of these rare CD's that brings me out it goose bumps the size of golf balls!! 'Inhaling Green' has all the great instrumental prog elements you could wish for and much more besides! As you would expect, there are masses of keyboards in all shapes and guises, but the CD also boasts some soaring electric guitar work from Geoff Whitehorn of Crawler, Rainbow & Procol Harum, some tasteful flute parts from Steve Hackett's brother John and as tight a rhythm section as you'll get, nearly all courtesy of Magnus himself! It's all here in abundance - just listen in awe to the high class melodies, sound textures, playing and production on this CD - Your jaw will drop during some of the powerful high spots and your eyes will water during some of the more mellow moments, but there is also a cinematic side to much of this music that will make those 'goose bumps' come and go with amazing regularity, so, I guess you could say that I think this is a pretty impressive album!!! The truth is, it's nothing short of one hours worth of sheer class music that has something for everyone who has ever been into keyboard derived music, whether it be progressive, electronic or filmic. The influences have come from a wide range of sources, sounds and styles and the whole album takes you right across a wide musical spectrum. It's totally creative all the way, exhibiting Nick's true class as both a (and I don't use the term lightly) quality musician and a sound producer with that rare ability to make you think about what you are listening to. 'Inhaling Green' surpasses anything else in it's league and is by far the finest keyboards derived, progressive related CD I have listened to for many many years. The set opens with 'Velociraptor', a blistering, band style, rock fusion track where Hackett-like guitars, organs and synths blast holes in your speakers over a storm force electronic rhythm section. Next comes the stunning 'Free The Spirit' with it's exotic ethereal intro which almost immediately brought 'goose bumps' to my whole body as the first waves of Mellotron rolled in under a striking flute/synth combination melody line shared between Nick and John Hackett. As the track literally soars through a whole host of melodic themes and utterly amazing chord changes, the climaxes are given the full works with choral and string synths working through a bed of Mellotron textures - wow, what a beautiful track, that sounds like something that might have been written for an instrumental section in a 70's 'One For The Vine' style Genesis / Hackett LP cut! 'The Devil And The Deep Blue Sea' is a similarly styled track with a piano lead line flowing over a sea of symphonic synth textures, with drums tightening the rhythmic/sequencer based end. Lush melodies form and envelop the piece in an exotic atmosphere with Nick's high class musicianship and production skills shining through and bringing out the best in the music. Mellotrons (I guess it's samples!) again weave in and out of the mix, but keep a fairly low profile, allowing the other synths to work the main theme and take control of the heart of the track. Then 'Cantus (On The Breath of God)' blasts in with a driving sequencer riff, closely followed by synth rhythms and quickly forming into an Enigma influenced track with the style of highly infectious beats that will drive the European market crazy - a contender for a single release without any doubt, that has THE most incredible production with synths jabbing in and around the beautiful male/female "Gregorian" choir arrangement - a must for anyone into Enigma (in fact this will drive fans of any Michael Cretu music wild with excitement!!) and perhaps there's a bit in there to for the Adiemus crowd too - BRILLIANT! 'Conquistador' flows straight down into Vangelis territory with a supremely gorgeous theme that equals anything the Greek master has produced for many a year, with full flowing synths and massed (electronic) choirs swelling the huge anthemic choruses in true epic movie score style. 'Dixon Hill' is something very different as it has a big band feel done in synth style - a funky little number with a quirky fusion based melody line, where the electric piano initially takes the lead, eventually giving way to really full sounding synth saxes and other cloned brass sounds, bringing 70's brass rockers Chicago to mind with a short 'middle eight' and an end sequence that sounds like one of those whistling synth melodies that Isao Tomita made famous on his reworkings of classical favourites. 'Veil Of Sighs' is beautiful - a track with just a hint of 'Scarborough Fair' about it, featuring the second appearance of John Hackett's wonderfully evocative flute work. It's unashamedly romantic, symphonic & neo-classical and makes me think of something between Steve Hackett's early solo albums and Thijs Van Leer's (of Focus) solo work. Call it what you like, it is a masterpiece of haunting, yet heart-warming instrumental music, with the flute carrying the main melody line, backed by masses of keyboards that swell up in grandiose fashion for the crescendos. 'Theme One' (written by George Martin & made famous by Van Der Graaf Generator) gets a dusting down for the penultimate track - a modernised, slightly more up-tempo cover of the piece that introduced Radio 1 to the masses back in the 60's. A pulsing rhythmic force runs through the cut and it feels like something an artist like Mike Oldfield might have done, had he come up with the idea first! Nick's lively rendition of this classic slice of 60's pop history is instantly enjoyable, giving a brand new image to a piece that has already proved to have mass appeal qualities. 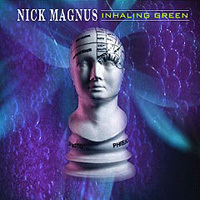 The epic 16 minute title cut; 'Inhaling Green' is a work of utter genius - a complete progressive/electronic crossover that is a perfect closing sequence to bring such an album to a to climax with. I would describe this piece as a sci-fi movie for the ears that comes in 3 episodes, the first of which opens in mystical fashion with the beautifully ethereal 'Anatomy Of The Mind', where a haunting electronic boys choir performs a 'wordless' vocal theme, sounding like something written for a film like 'Titanic' or 'Edward Scissors Hands'. It's eerie, yet beautiful, with choral textures and sweeping synth strings swelling up through the evocative main theme whilst stirring your emotions to breaking point. This crossfades peacefully into the sensational 'Stripping Of The Flesh', which offers a different angle to a familiar theme - Enigma style rhythms, female voice and synth melodies form the backdrop for a piece set in the future, with two robotic electronic voices performing a narrative as the music takes you through the mind expanding landscape. A thrilling, soaring electric guitar solo comes in towards the end of this passage as do several creative electronic effects, all making for a wonderfully majestic atmospheric environment. This incredible track (and the album) ends as the piece moves into 'Weighing Of The Souls', the third and final movement on the title track, starting out in weird and wonderful space territory with effective sound sampling. In comes the ghost of Steve Hackett in the guise of Geoff Whitehorn, with his guitar on fire, searing and driving headlong through huge wedges of keyboard chords, creating several dramatic climaxes along the way, with massed synths and powered-up percussion flying high in the mix. Here, the track sounds like some long lost Genesis epic, as it builds towards it's finale, then crossfades back to reprise the opening sequence, where the sound of the robotic voices blends with Mellotrons and heavenly chorals to end this magnificent "movie for the ears" in dream-like fashion - 16 minutes of classic, dynamic musical splendour! "Creating movies for the ears"
Inhaling Green takes our hero even further than his previous album Straight On Till Morning which was definitely one of 1993's hidden gems. This new project sees Nick expanding his horizons in a variety of ways. The album opener Velociraptor is, unlike its title, no dinosaur of a track; instead it is a Hi Energy start to the proceedings with a superb synth rock track which even Genesis legend Tony Banks would be proud to call his own. This is in turn followed by the filmic beauty of Free The Spirit, which definitely belongs on a soundtrack somewhere if there is any justice - film producers take note! Nick manages to weave the sounds of a variety of instruments into a delightfully whistful whole. The Devil And The Deep Blue Sea is another track which deserves to be in a film. Certainly there is a mixture of drama tinged with romance to this one and I am sure that someone will eventually set lyrics to it at some point, turning it into a delightful song. As Nick himself said during our interview, Cantus is the album's first Disco Diva track, with a space aged introduction and infectious rhythm track which to my ears can best be described as "The Pet Shop Boys meet Enya" and this would be a HUGE hit on the dance floors if released as a single. Conquistador harks back to a more melodic time and is "High Noon meets The Magnificent Seven" - an austere track full of the pride and passion of Old Spain. Dixon Hill is the Swing band track, which for some unknown reason reminds me of the theme tune to the Eighties detective series Shoestring. This is in turn complimented by the delightfully romantic Veil Of Sighs whose main theme echoes the classic Are You Going To Scarborough Fair tune without being in the least derivative. The flute is simply gorgeous, and the accompanying guitar and keyboards are delightfully understated - a classic! Nick's "four on the floor" version of Van Der Graaf's classic Theme One is still as infectious as the original was all those years ago, and this is almost Oldfield-esque in places, and a suitable companion for Cantus. 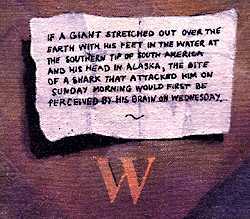 The album's title track and magnum opus (or should that be Magnus opus?) rounds off the album, beginning with Anatomy Of The Mind which is a delightfully atmospheric piece that weaves a spell of magic over the listener, and which echoes in the vaults of the mind long after it is over. Stripping Of The Flesh is an infinitely more strident piece accompanied by another infectious bass rhythm and an eerie vocalisation which in turn leads into the final piece of this suite; Weighing Of The Souls which continues the theme with a truly awesome keyboard fanfare echoing back to the halcyon days of "progressive" rock at its finest, and the haunting vocal mantra combines with some superb playing to draw the album to a highly satisfying close.